With a suspected subterranean sea of liquid water, oceans of methane on the surface and an atmosphere that could give rise to non-water-based life, it's no surprise that scientists are keen to learn more about Saturn's moon Titan. 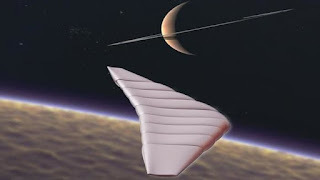 To that end, a new joint project between the Global Aerospace Corporation (GAC) and Northrop Grumman Aerospace Systems (NGAS) is developing a new exploration vehicle designed to soar through the skies of that mysterious moon. The proposed Titan Winged Aerobot (TWA) is inspired by Northrop Grumman's T-LEAF (Lifting Entry Atmospheric Flight) class of vehicles, which would allow the craft to gently enter the atmosphere before transitioning into flight mode. Once there, the TWA would operate like a hybrid balloon and glider, utilizing a unique buoyancy system to allow it to ascend and descend without the use of propulsion systems or flight control surfaces. Minimal moving parts means it could squeeze more juice out of a single radioisotope power source.